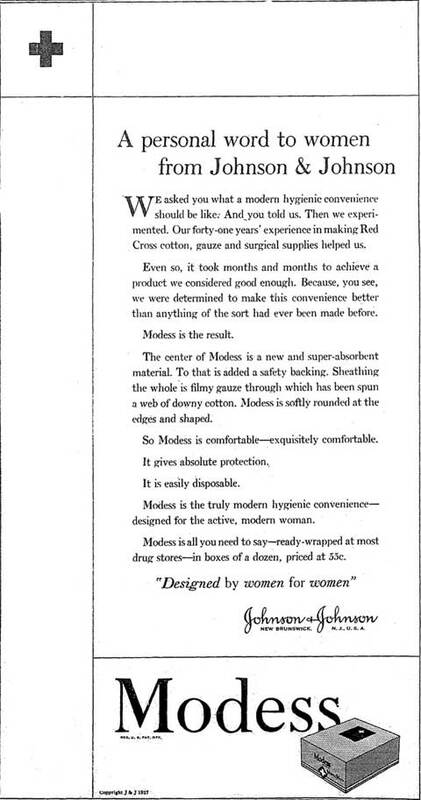 Modess, which Johnson & Johnson made to compete with Kotex, developed at least partly from the research of Dr. Lillian Gilbreth, the famous efficiency expert and center of the book and film Cheaper by the Dozen. She wrote a report (here) to Johnson & Johnson in January, 1927, that uncovered women's desires and dislikes about menstrual pads. J&J seems to have taken her recommendations seriously - simple box design is one - as you can see in these ads and here. Note the cross, typical of early menstrual supplies. Both Johnson & Johnson and Kimberly-Clark, which made Kotex, made bandages before menstrual pads so you can see a connection. (See a Kotex cross.) But the cross exphasized the medical connection and "bandaging a wound." A retired teacher kindly sent the electronic files of the ads. Below: from The Syracuse [New York] Herald, July 12, 1927.